In June 2011, the project cargo ship EOT SPAR was to load more modules than its hold could carry. An elevated stowage was designed using simple vertical ladders and heavy support beams in way of the module support points. The system was designed based on readily available materials and such that it could easily be installed, removed, and re-used, if needed. 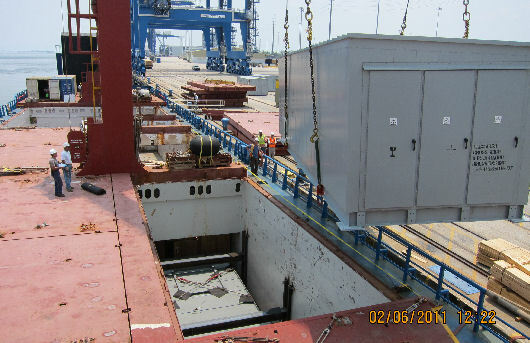 Photographs courtesy of GJWermuth Marine Consulting LLC. FE analysis of the vertical ladder support.